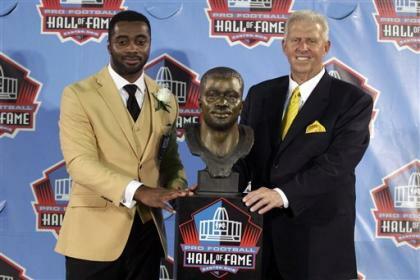 CANTON, Ohio – Curtis Martin never wanted to play football, never thought he'd live to age 21 and never imagined being inducted into the Pro Football Hall of Fame. But Martin, in pouring out his heart about how the game played a part in his salvation, may have helped repair the game's image Saturday. At a time when football, and the NFL in particular, have come under criticism for concussions and suicides believed to be related to head trauma, Martin gave anyone who had the honor of listening to his stirring Hall of Fame induction speech plenty reason to embrace the game. The former New England Patriots and New York Jets running back, an everyman-type who worked his way to be one of the game's leading rushers, spent 27 minutes baring his soul and telling the audience about how football saved him. Even though he never had much passion for it. For Martin, football was an escape from a home life that was tragic. Martin, who spoke without notes but with a clear understanding of what he was trying to say, recounted the violence of his young life. He talked about how his father used to "torture" his mother by burning her hair with a lighter or her skin with lit cigarettes. He recounted again how his grandmother was found beaten to death in his family's apartment when he was nine. He remembered being 15 and having a gun pointed at his head as the gunman pulled the trigger seven times without the bullet firing. Finally, when the gunman pointed the gun away from Martin, the gun discharged. Martin talked about learning to excel in a game that he barely enjoyed. When he was drafted by the Patriots in 1995, he got off the phone with then-coach Bill Parcells, turned to his family and said he didn't want to play professional football. That's when his pastor, Leroy Joseph, said: " 'Curtis, look at it this way … maybe football is just something that God is giving you to do all those wonderful things that you say you want to do for other people.' I tell you, it was like a light bulb came on in my head." Helping other people included what he calls his greatest accomplishment – getting his mother to forgive his father. Martin grew up watching his mother deal with the beatings from his father. "You'd get punched in the face and go to work with a black eye with makeup on just to support us," Martin said as he looked at his mother Rochella Dixon. He recounted that after his grandmother was killed when someone took a knife to her chest, he asked his mother if she was going crazy. His mother said no, but then asked why he wanted to know. "Because if you go crazy, nobody's going to be here to take care of me," Martin said, taking the collective breath from the audience. 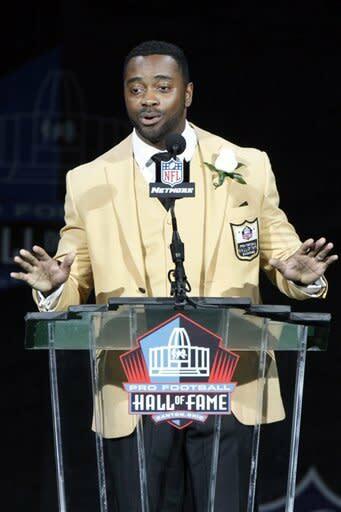 As Martin joined Willie Roaf, Jack Butler, Cortez Kennedy, Dermontti Dawson and Chris Doleman in this year's class, he started by talking about how little passion he had for the game initially. He took the game up only after being pushed into it by his mother pleading with him to do some type of after-school activity. She wanted him to escape his neighborhood and life in inner-city Pittsburgh. That morphed into him being offered scholarships by multiple schools. "That didn't add up," Martin joked. "That's two things I don't like, school and football." Instead, he promised that if he made it to 21, he would give his life over to his faith and "do whatever you want me to do." In this case, that was football. For a man with little passion for the game, Martin played as hard as anyone. Former coaches and teammates have spoken over the years about Martin's toughness and willingness to play through pain as he gained at least 1,000 yards in each of his first 10 seasons. That toughness was nurtured (perhaps coerced) by legendary coach Bill Parcells, who presented Martin for induction. Martin recounted several Parcells stories and "Parcells-isms" as he put it. One of those was when Parcells, after getting a call from an ailing Martin, said, "You should never come out of the huddle because you never know who is going in the huddle." That was Parcells' way of telling Martin that everyone was replaceable. Martin admitted that his jealousy of any teammate who played running back drove him to outwork them and anyone else on the team. For a man who had little passion for the game, Martin threw himself into it. This weekend, he started to grasp the love of the game when he listened to other Hall of Famers talk about their experiences. And he came to a conclusion that might answer the fears of a lot of other people who are thinking about the game. "I was asked by a reporter earlier this week if I would allow my child to play football," Martin said. "I don't know, I would probably be reluctant. But if my kid can learn what I learned from this game, I'd let him play. I think it's worth the risk."